Last week was National Stationery Week here in the UK. During this joyous week of celebration of paper, pencil, pen and ink I was contacted by the delightfully named Anna Rainbow from The Pen Company asking if I would like to review one of their items. It would have been rude to say no. 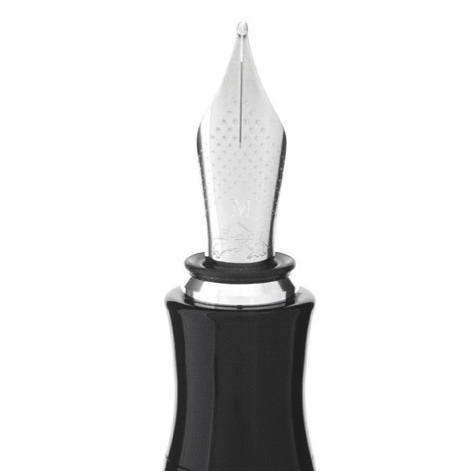 After chatting for a while we settled on the dramatic looking Faber-Castell Ondoro fountain pen, which was duly despatched. Having now had the chance to use the pen for a week or so I can now share my thoughts with you. It was the unique and striking design of the Ondoro that originally attracted me to it, and it doesn’t disappoint in reality. 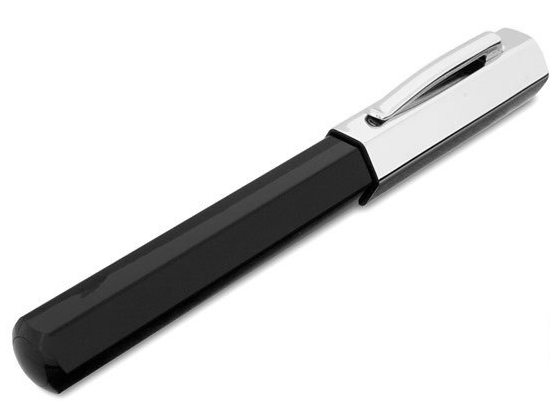 The body of the pen is hexagonal, something more commonly found in a pencil than a fountain pen. 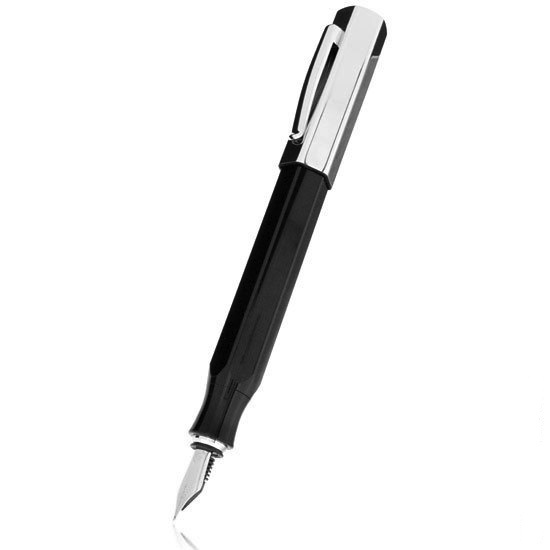 I chose the black and silver version of the Ondoro; the contrast between the cap and the body adds to the striking look of this pen. The body tapers down from the large hexagonal shape to a smaller cylinder for the section; a transition that is both visually appealing and nicely done. There is little in the way of branding or marks on the Ondoro to spoil its clean lines; just a subtle Faber-Castell logo on the top of the cap. The nib is a simple steel nib with a pattern of subtle dots, the Faber-Castell crest and a sizing marking; in my case M for medium. Faber-Castell say the body of the Ondoro is made from “precious resin”. Now I know that one day oil will run out, but really there is no way you call plastic, for that is what it is Faber-Castell, precious. That being said it is a really good quality resin with a deep shine, a reassuring solid feel, and a pleasing tactility to it being not too smooth or slippery. I’d love to tell you what the cap is made out of, but I’m really not sure. I’ve seen it described as chromed, chrome and chromed metal, but I actually think it is chromed plastic, albeit a very high quality one. If it is metal it is non-ferrous as only the clip is magnetic. The cap is the one weak area of the pen in my opinion; the body is high quality, but the cap feels a little cheap, and not at the same level of quality as the rest of the pen. The clip is spring loaded and formed from pressed metal which works well, but adds the slightly low rent feel of the cap. In contrast where the section screws into the body Faber-Castell have used high quality metal threads which feel lovely and should last for years. Cutting to the chase the Ondoro is a very pleasant fountain pen to write with. Being a steel nib there is little or no flex, but it’s not the ‘nail’ that steel nibs are sometimes described as by sniffier fountain pen users. When my pen arrived the nib was a rather dry writer, making it on the fine side of medium. A quick adjustment with a razor blade has increased the flow, line width and most importantly the smoothness. Even with the increased flow and a super smooth ink like Noodlers Black the nib still has a little ‘toothiness’ to it. I don’t have a problem with toothy nibs as I find they help control my rather wayward writing, but I do feel on certain upstrokes that this nib seems to catch the paper slightly, not enough to affect your writing, but enough to bug someone as ahem sensitive and fussy as me. I’ll declare at this point that I hold pens at a slight angle which can exacerbate nib issues, and that I normally write with a pen that cost four times as much as the Ondoro – so as well as being fussy I am a little spoilt. But I believe that virtually all of you reading this review will have no trouble at all writing with this pen and on the contrary will find it a fine pen. The section is a good diameter and shifting your fingers back slightly to hold the hexagonal body is also a very pleasing way to hold it. The pen is light but a nice weight so it doesn’t become fatiguing when writing for longer periods. The Ondoro is a little short to use without posting the cap, and the one advantage of the cap being of lighter construction is that doing so doesn’t upset the balance of the pen. The Faber-Castell Ondoro is one of the most dramatic fountain pen designs I have seen for some time, and is very well made although the cap could be better. But most importantly the Ondoro writes very nicely and will do so for years I feel. I’m very happy to recommend both the Faber-Castell Ondoro and The Pen Company who have an amazing range of pens, great service and a real passion for their products. This pen was my first pen and the one which got me into fountain pens! Great review! Hi David and thanks for this review. Some questions if that’s ok… firstly, did you use the razorblade trick between the tines, or did you have to take the nib out and enlarge the ink channel? And last but by no means…. does it start straight out of the cap every time (it’s that lack of a breather hole that makes me ask that). @Jeff – Yes I used the razor blade between the tines trick, and it improved the flow greatly. It has started first time, every time for me. The cap is a little lightweight, but other than that it is a very nice pen. Very very good for the cost I think. Hi David and thanks for this review. I have a question, What is the durability of resin and is it prone to scratch in day to day work? @bhushan – Thanks! The resin is of very high quality and is wearing well.